Okay, Rosa Brown is currently in the wash. I think she'll need to be laid flat to dry, but pretty - I'll get someone to take another headless snap of me with it on. 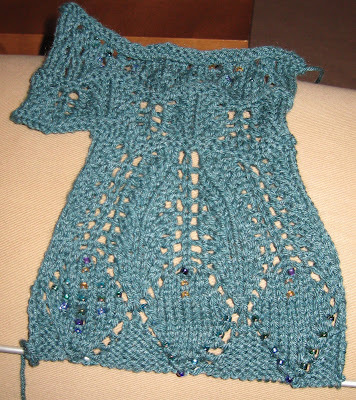 Next, we have a tiny, fuzzy, crappy snap of the peacock caplet. This is the collar, it will fold over and the right side will become the wrong side in a few more rows. I should post a snap of the graph for this puppy, kind of crazy. 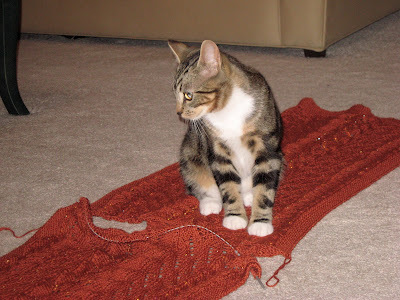 But first I want to knit the prototype. 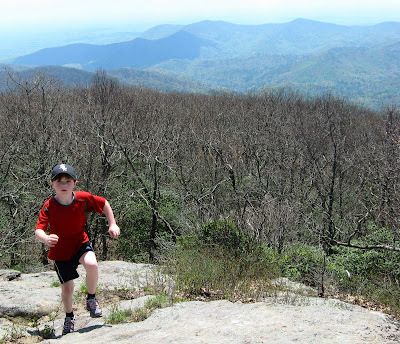 And finally, on Saturday we hiked Blood Mountain. It's one of my favorites around here. The leaves are pretty much fully out at our house, but on top of the mountain they were still buds. Kind of cool the way you can travel in time just by changing elevation. Okay, my lame commercial quote doesn't even make sense, but I was casting about for something to say about this incredibly dull brown sweater I'm nearly done with. 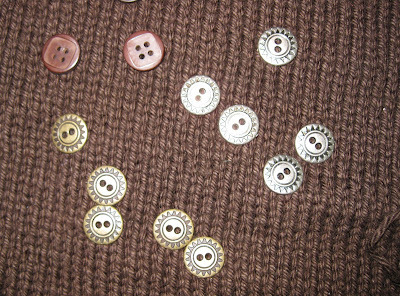 Here are the buttons I had selected. I then had my husband pick the ones I'll use. He picked brass. He's way better at this stuff than I am. But I think I've mentioned that before. I like the silver ones too, but they'll go on something else. My, what boring beads you have purchased. What do you think you're doing? The white and silver are for a test run of a wedding shawl I'm working on - I got both size 6 and size 8 to see which work better, and the black and sterling, that's for a variation on the peacock. Which I'm graphing. Slowly. They need to be blocked. And no, they aren't for me (I'm not a pink person, my skin is too yellow) but I'll find them a home. They're sort of fun, and very soft. 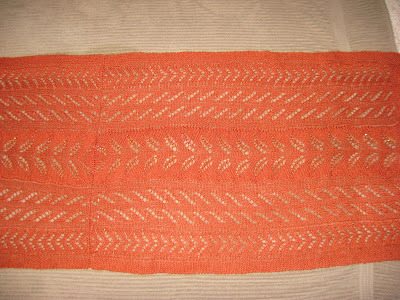 Now, I want to get one more of the bigger things out of my knitting basket before I start work on the peacock caplet, so I guess that means the brown cardigan is next. These aren't new, I've been working on them for a while. So long in fact, I spaced what I'd done to mod the pattern. 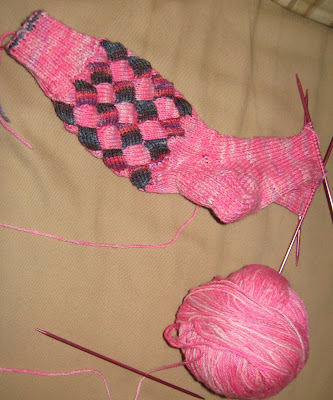 Working on sock two, I did the entrelac on the wrong size needles. After an evening of "hmm, is it close enough?" my better self won out and I ripped it back and have been re-doing it on the right size needles. 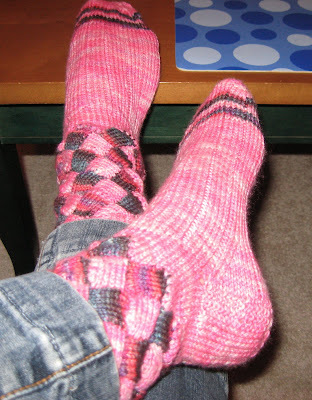 Entrelac is fussy work, for these socks it's done on small size (2's and 3's) short double point needles. Sometimes working on something like this would make me feel insane with boredom and fussiness overload. But when I'm really tired, like my joints hurt kind of tired, working on something like this makes me so happy. The tiny needles, the tidy little stitches, the little patches of color and discrete increments of progress just make me smile. Once upon a time I heard, or read, that when you're sad or depressed, cleaning is a good way to cure that, or at least a way to break yourself out of the funk. The physical activity provides endorphins, the task gives a concrete goal that can then be accomplished and hey, who isn't cheered up by those nice clean smells? So, I clean when I feel like I need to be perked up. But entrelac socks are more fun. What do you do for unwinding knitting (ha, I made a dumb funny, get it? Unwinding? Okay, I'm very tired.)? Lace? Socks? Gloves? So I'm on one of my kicks where I try and clean up my knitting basket. Which is boring and doesn't give me cool new things (well, okay, be fair, cool to me) to take bad pictures of. But soon, I'll have the second pair of entralac socks done and the brown Rosa (I'm on the sleeves) and I'll start the peacock caplet. But I had some other ideas too. I want to do the caplet in black with jet/hematite beads for evening wear and see how it works. I want to design a wedding shawl, maybe white doubled lace weight yarn with clear iridescent beads? I need to look for interesting edgings and flower lace patterns for that, do a little research on traditional flowers for love, faith, etc.. I want to design a beaded cardigan with the purple gloss (which they aren't making anymore, which stinks). 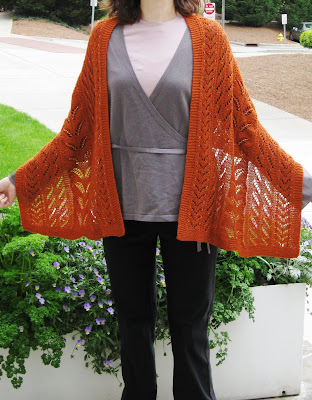 I charted a modified leaf pattern for Yarn or Death, but I haven't had a chance to test it and find it's kinks - and there are always kinks - but I think it might work for this. I love going biking, it's very restful and I get all these ideas. I need more hands. Here it is, all blocked and modeled by my coworker - who is the perfect model for this sort of thing, being tall and slender and willowy. 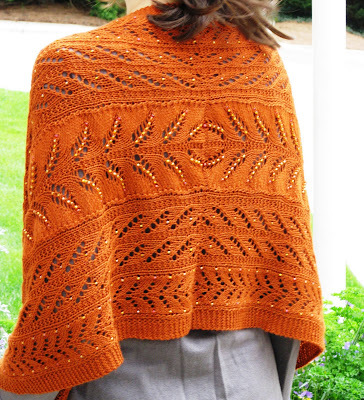 I'm going to charge $5 for this pattern, I'm in the process of getting that function turned on in Ravelry, so you'll be able to get it there too, soon. For now, I'm going to set up a widget here so I can take PayPal payments and send folks the pattern if they want it. Well, drying at least. The beige towel doesn't exactly show it off to best effect, but I'm hoping to force someone to model it for me tomorrow. Someone who looks good in orange. I'm glad I wet blocked it - a lot of color came out of the yarn (which didn't fade, it just had a surplus of dye) because I hate to think of ruining someone's shirt because they wore it and then it got wet. The two sides of Bittersweeet are done, now I just have to see if I have the requisite skills to kitchner together lace. Oh, and I've been looking a buttons. And there are some absolutely lovely ones, but since this will be a throw in the wash sweater, I'm going to wait and look at JoAnn first. Between little league and work and other random stuff (like wanting to live in a house that doesn't smell) I've been doing lots of knitting, just nothing very new and exciting, so I haven't posted. This should change now, as I'm at the end of a lot of things. I kind of have a Soviet-era "storming" thing I do, don't I? So, I'm nearly done with the second half of Bittersweet. This first picture gives a better representation of the color, and even though you can't see much of the beads, you get a better sense of how they glint out of the deeper pumpkin color. Indy thinks it's nice and warm on his rear end. 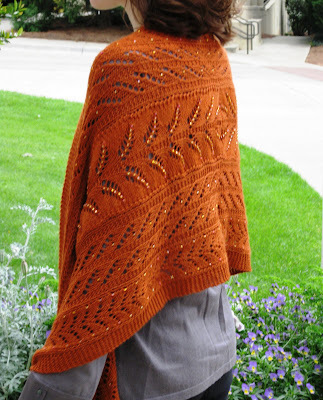 This in a brownish green or dark red, any color combonation that works with the fall motifs I think would work. This next thing is just a swatch so far, but it's going to be a peacock feather caplet. I spent weeks graphing, swatching, not getting it right, ripping out, re-graphing, re-swatching and once I got the lace and increases right, I had to decide how to work in all the colors of beads. I think the gold ones will move up more towards the tips of the feathers, to look more like a real eye. I can also see this working well in other color combinations - dark rose with sparkly silver and pink beads, like pinks or bachelor buttons, or you could do it in black with silver or iridescent beads for an evening wear sort of thing (or if you just go for drama). It's going to have 3 buttons at the top and the two sides will have a fine XO cable - I like using thin cable panels for buttonholes, but you can only get away with that if you are working at a fairly fine guage. And finally, this boring brown thing. 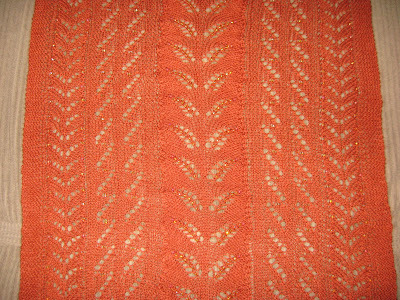 Rosa Rugosa - the back is done, the fronts are halfway there and the sleeves are 3/4, so it shouldn't take much longer. But I need buttons, ones that can go through the wash. I'll have to look around and see what I can come up with.